Ever since the first chain was put on a bicycle people have had heated debates on the best way to lubricate it. There are all kinds of lubricants, anything from bio degradable vegetable based oils, to high tech synthetic lubricants with nano-particles. There many opinions on what is best, but that also depends on what aspects you think are important, and the conditions you ride in. My my bicycle has a fully exposed chain with an internal gear hub. It's mostly used for weekend trips on the road, so mostly dry conditions. The bicycle is stored inside, and has to be carried up the stairs, and will also be regularly taken into trains. For me it is therefor important that the chain is clean and does not leave greasy stains on anything that touches it. It was several years ago when I first learned about Squirt. St first everybody was rather skeptical because it is well known that wax based lubricants don't work that well. Soon it turned out that out this stuff was the real deal: decent lubrication that lasts longer than any other wax, yet does not attract dirt. For my new bicycle I wanted to get some Squirt, but not many bike shops have it. I looked into ordering it online, but shipping costs were significant. Then I found out that Santos, a Dutch manufacturer of high end bicycles now recommends Squirt chain lube, and all their dealers sell it. So after locating the nearest dealer which happened to be in town I was able to buy a 150 mL bottle of Squirt chain lube. 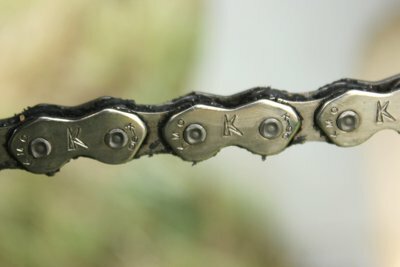 I used the chain lube on two bicycles with a KMC K810 nickel plated chain and a single 18 teeth sprocket in the rear wheel and 32 teeth on the chain ring. There are several contradicting instructions on how to best use Squirt. The website says to degrease the chain and apply it three times, with 3 hours in between each application. The bottle told me to apply it only twice with several minutes between each application. Personally I agree with those who say that one should never completely degrease a chain. This will dissolve the grease that is deep inside the chain links, and getting new grease in there will most likely not be any better than the grease that was there originally. It also happens to be less work. One of the main causes of dirty chains is people over-lubing them. For my new bicycle I did not do anything to the chain and gears except for wiping off the dirt with paper towels once in a while. After several hundreds kilometers they started to make some noise, indicating that they needed some lubrication. I applied the Squirt as instructed, on the inside of the chain with a drop on each link, and repeated after a few minutes. It seemed a bit excessive, but according to the instructions this is normal. At first the droplets were white and opaque, but as they dried up they became transparant. However, some waxy material was visible between some of the links. The idea is that the excessive wax and any dirt trapped in it will will simply fall off while riding. Applying droplets of squirt chain lube to the rollers of the inside of the chain. The first ride was about 50 kilometers, on paved roads in dry conditions. 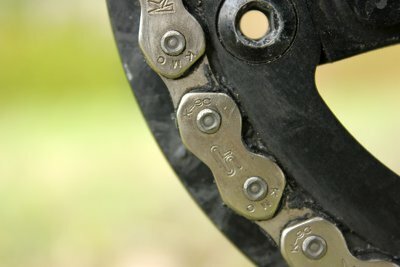 The chains ran quietly, but there was some grime on the top and bottom of the chain and around the teeth of the gears. It seemed to be a mix of the original chain lube, Squirt, and dirt. I touched some of the grime with my finger. Normally when you do this it will take some degreasing soap to clean it off. In this case the grime felt drier and could be rubbed off my fingers with hardly leaving a mark. Grime on sprocket after first ride with Squirt chain lube. Grime between chain links after first ride. Being slightly bothered by the grime on the chain, I cleaned one of the chains and the rear sprocket by wiping the grime off with paper tissues. We then used the bicycles on a 3 day trip, for over 150 kilometers. The conditions were dry, both drive trains were completely silent throughout the trip. The only sounds were the wind and the tires buzzing over the road. On the way home we had to take the bicycles in three different trains, no chain stains were found anywhere afterward. It seems I can go about 400 kilometers in dry conditions before the chain starts to sound dry, and even with a slightly noisy chain you can keep going for quite some time. Riding in the rain quickly washes the lubrication away. It is sometimes noticeable after just one ride in the rain. Leaving the bicycle out in the rain does not have that much effect on the chain lubrication. After the first few applications the grime seems to have gotten less sticky; it leaves less marks, but is harder to clean off the chain and sprocket. So far I have used paper towels for cleaning of the grime from the chain and sprocket, no degreaser. Some grime is deposited on the teeth of the gears after using Squirt regularly for 6 months. 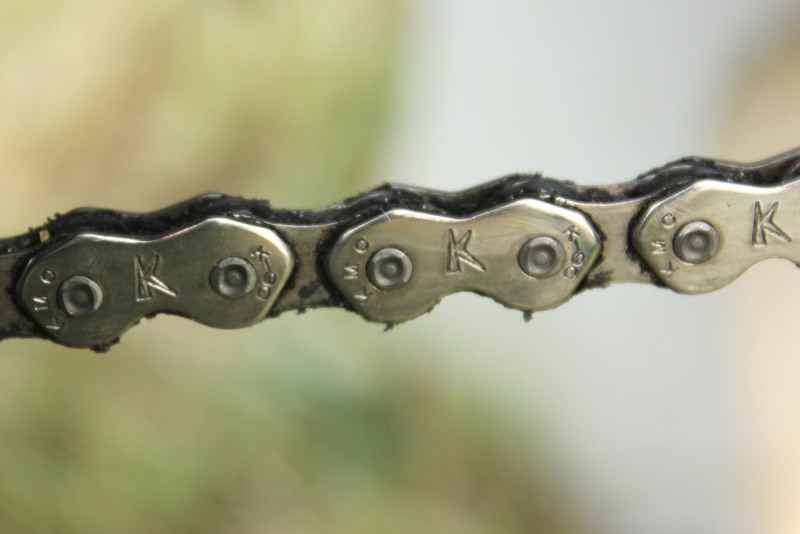 Grime accumulates between the links of the chain after using Squirt regularly for 6 months. After moving to another city I started using a folding bicycle with a nine gears and a derailleur on the rear wheel. I take it on the train practically every day for about six months. I used Squirt chain lube on the chain which previously had other lubricants on them. The goals was again to keep the chain as clean as possible to avoid smudging my hands and clothing when riding and handling the bicycle. 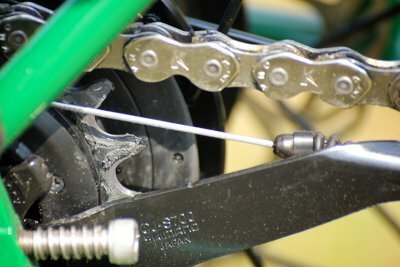 During the summer months I rarely had to apply the chain lube and it would last several weeks before I had to re-apply. It seems to last shorter than on my other bicycles with an internal gear hub. Riding on wet streets quickly washes away the lube, the worst was during the winter when the roads are covered in salt. 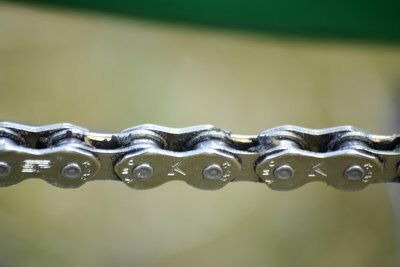 The chain rusts and dry out very quickly and cleaning the chain every time became quite cumbersome, especially when it is wet and cold outside. I eventually switched to a more traditional wet chain lube to get me through the winter. So far the experience with Squirt chain lube is pretty good. Not having grease stains is very nice when regularly lifting the bicycle up the stairs and in and out of trains. The lubrication is decent in dry conditions. In the rain it quickly wears off, and needs to be re-applied. I was hoping that the grime would fall off and leave the chain looking clean all the time. This is unfortunately not the case. The good news is that the grime does not stick and leave stains like oils and greases, and can easily be wiped off with a paper towel. On a bicycle with derailleur chain lube has a bigger impact on the ride quality. Squirt works reasonably well in dry conditions, but in wet conditions it quickly washes away. In wet, cold and salty conditions it needs to be applied too often for my liking. I have stopped using it in the winter months. This article will be updated when there is more to report.